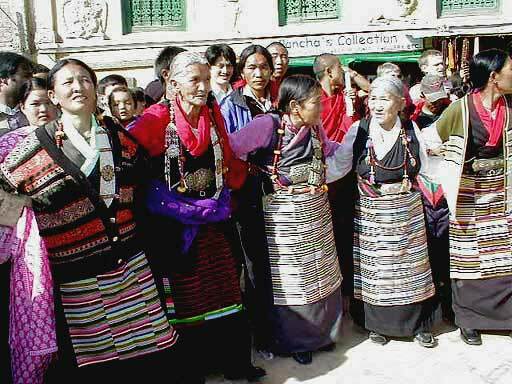 We are now in the year of the snake, though some thought that began with the inauguration of W. Last Wednesday was the final of three days of both Sherpa and Tibetan Losar. 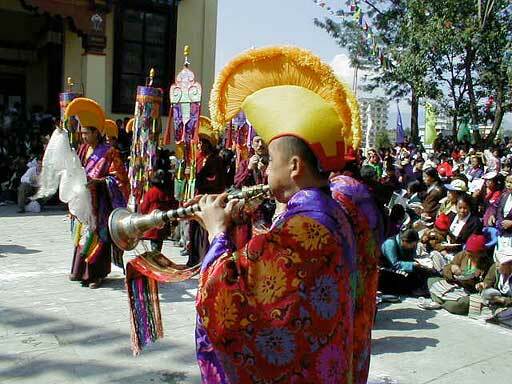 It is not surprising that they celebrate the arrival of the new year on the same lunar date for both came from Tibet, only about 500 years apart. Though at home in the high Himalayas, a substantial number of Sherpas now live in Kathmandu. 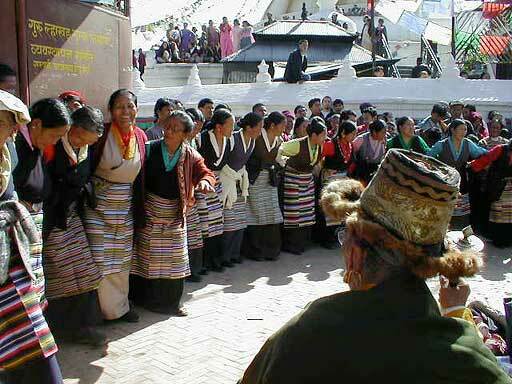 About 12,000 Tibetans have likewise settled here, primarily in the vicinity of the stupa at Bodhnath. Not knowing quite what to expect, we arrived at the Sherpa gompa, a few doors down from the stupa, at about eight Wednesday morning. 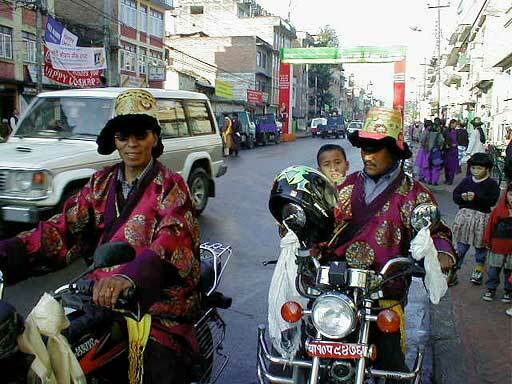 A motorcade was forming on the busy street outside the stupa with a horde of motorcycles (photo A), floats, trucks full of monks and nuns, a truck of lamas and several trucks of ordinary folks (photo B) like us. As we stood trying to figure out what was going on, a Sherpa man motioned for us to hop aboard one of the trucks. Soon we were off on a two hour tour of Kathmandu with blaring music, parade trucks passing each other with festive abandon and cheers from the prevailing occupants, and the tallest stupa float clipping phone and power lines with its spire. 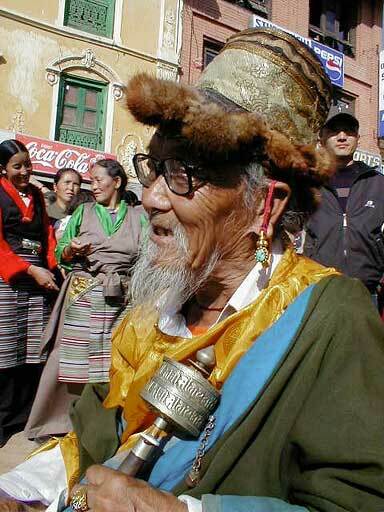 When we returned to the gompa, the courtyard was crowded with Sherpa people in festival clothes. 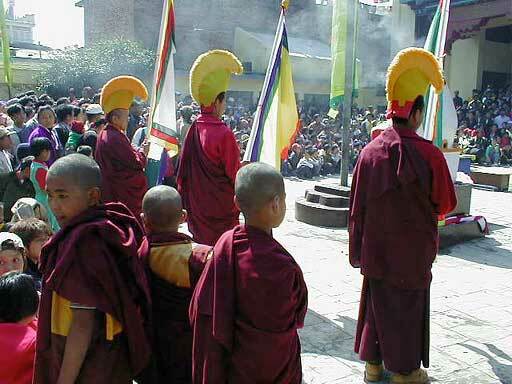 As the lama dancing began, young monks watched what might be their future (photo C). The dancing was spectacular in every way imaginable - the setting, the spectators, the music, the costumes, the dancers (photo D, photo E, and (photo F). 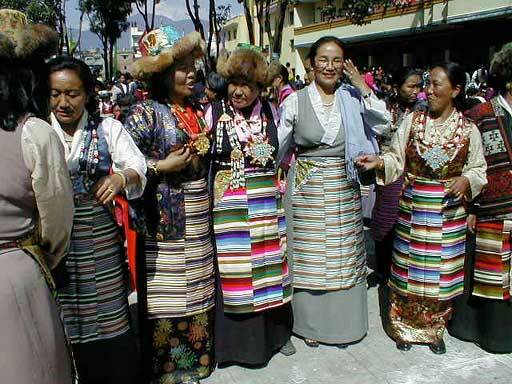 After the lama dancing, the spectators, like these women (photo G), began traditional circle dancing. Food and drink were continuously served to everyone. 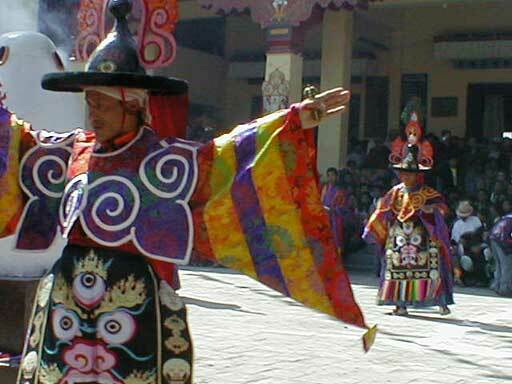 A couple of Sherpa men, generously lubricated with homemade chang, pulled me into the men's part of the circle to join the dance. Sober, I didn't last long. When we walked over to Bodhnath, new prayer flags had been strung and the freshly whitewashed stupa was being doused with sampa, a mixture of flower and spices that stain the walls until next year (photo H). 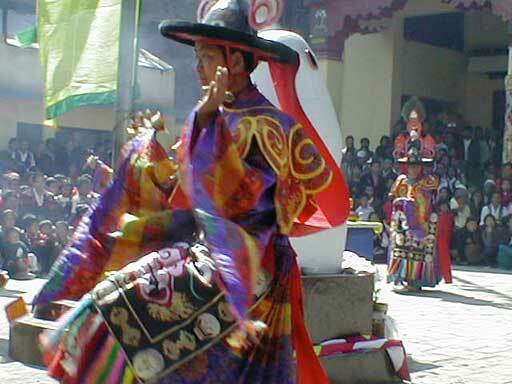 Beside the stupa, Tibetans did traditional circle dances for hours on end, with an ancient lama spinning his prayer wheel in the middle of the circle (photo I, photo J and photo K). 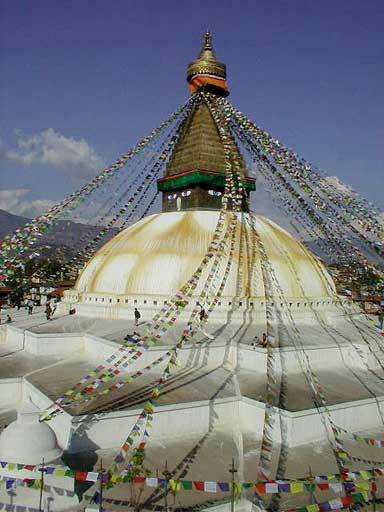 The great stupa looked splendid in its new year's attire (photo L).